Celebrating my half birthday with Whitewater Rafting has become somewhat of a tradition for me, even though this is only the second year that I have organized such a trip. And, this year’s trip was a doozy! 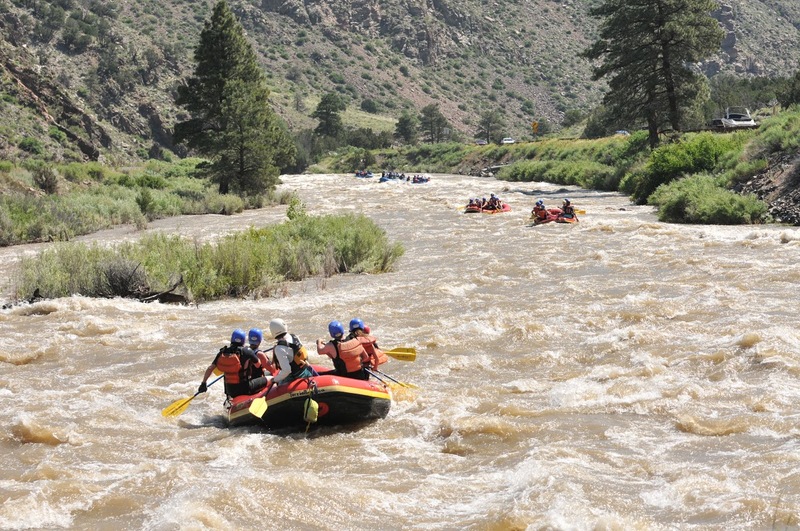 Mid June is typically prime-time for rafting in Colorado, as a combination of snowmelt from the mountains and periodic spring thunderstorms create the faster moving waters that adventurers seek. This year, however, an unusually rainy May across Central Colorado created rapids on the Arkansas not seen in a generation. According to our raft guide, this is the highest the water had ever been on June 20th, and the highest the water had been since 1995! And, of course, the river reached what is referred to as “flood stage” the day before the trip. Even the calmer parts of the trip were quite rapid. 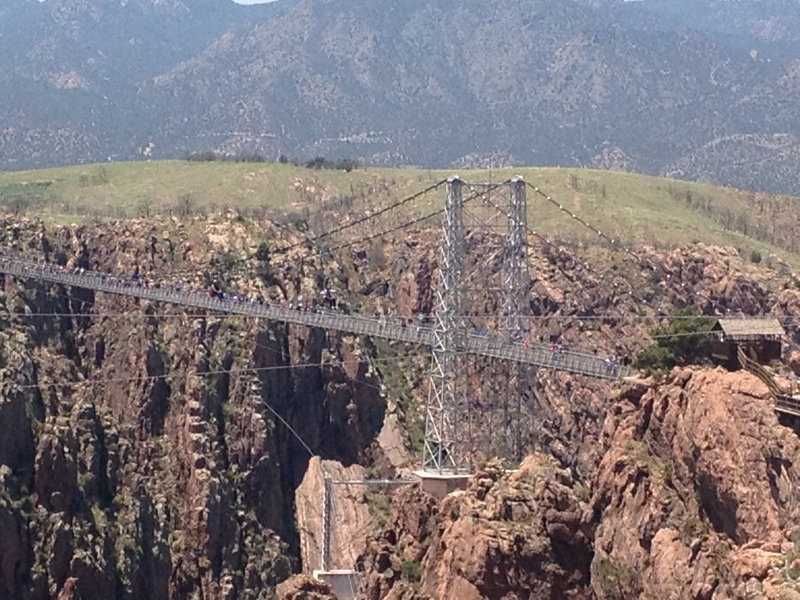 The trip we signed up for was Performance Tours’ Royal Gorge half day trip. With the speed that we were moving downstream, we covered the 10 mile distance in a little over an hour. 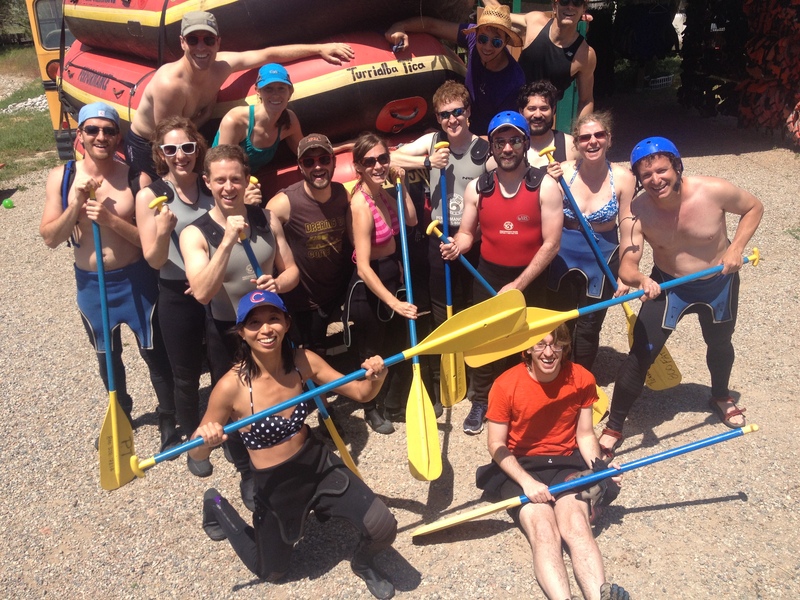 As is the case with nearly every commercial rafting outfitter, we began our trip on somewhat calmer waters so we could figure out our paddling rhythm and review some commands prior to tackling the bigger rapids. Last weekend on the Arkansas, this was about as calm as it got. It was not long before we were fully in rapids, ones that would be considered class 3 and 4. The raft frequently bounced up and down during this entire middle section of the journey. The roughest stretch came about 2/3 of the way into the trip. It was a section of rapids that the instructor said some consider class 5, which is the highest rating navigable. Unfortunately, we were not quite so lucky here. In this section of rapids, our raft was quickly flung to the right bank of the river by a powerful burst of water. The raft tipped sideways, dumping all six occupants (including the raft guide) into the rapidly moving river. I did not even believe it was happening at the time. On these rafting trips, many people look out the bus window, at the rapids they are about to take on, with a feeling of terror. I had always believed I could conquer anything, as, well, for some reason rafting just never really scared me. I just handle the bumps, lean in when necessary, and enjoy the ride! But this time, we were all really going down. Before I knew it, I was directly underneath the raft for what felt like an extended period of time (but in reality was only about 3 seconds). Getting out from under the raft, and being able to pick my head up out of the water and breath was quite the relief. It was an even bigger relief when I was able reach out and grab the paddle that our rafting guide extended towards us to pull us to shore. And, although only three of us were able to grab onto that paddle, all five of us got out of the river with little to no injury. After recovering my breath after all the water I swallowed while taking the unplanned dip into the river, all five of us got back on the raft and finished the trip. It was quite the experience, one that the rafting guides told me, makes you “a pro”. Perhaps the craziest aspect of the rafting experience was having the trip all to ourselves. 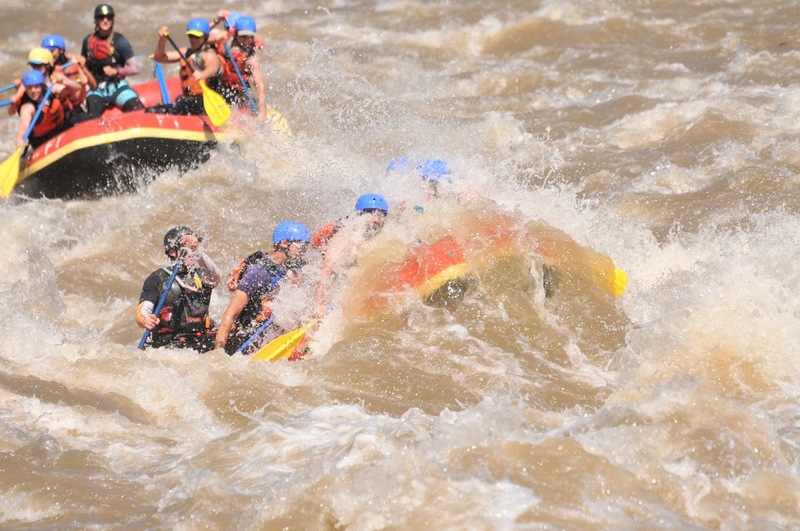 Almost every whitewater rafting trip one will take on, particularly on a popular river during a popular time of the year, is shared with strangers, basically, whoever also booked this particular trip at this particular time. However, on this particular tour, perhaps due to sheer luck, or perhaps due to people canceling their trips due to the enhanced danger, my group of 16 ended up having the trip all to ourselves, which made the back and forth banter between the three boats on the trip interesting. The one real drawback to having the water levels as high as they were was that it prevented us from physically rafting through Royal Gorge, which could not be entered (by raft) safely under these conditions. 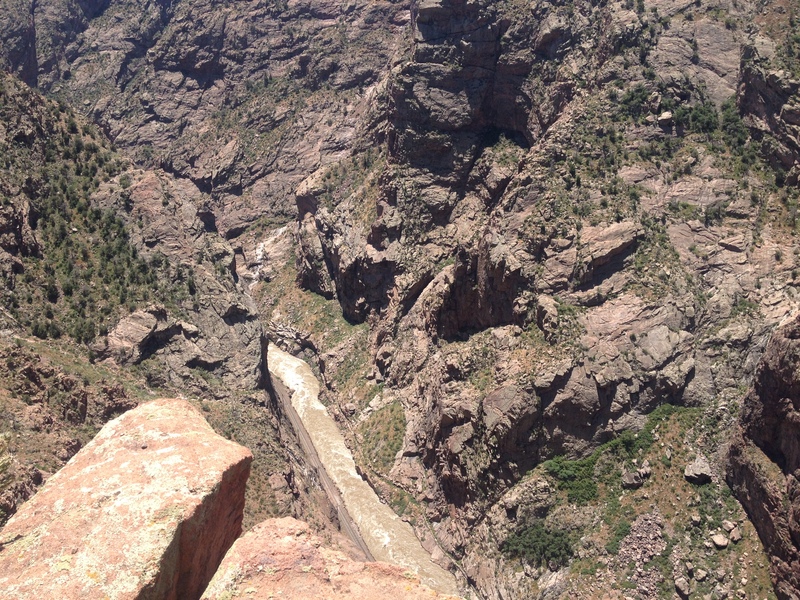 It would have been amazing to actually traverse right through this gorge on a raft. And, on a calmer year, or in a calmer part of this year (say, August), it will be possible. 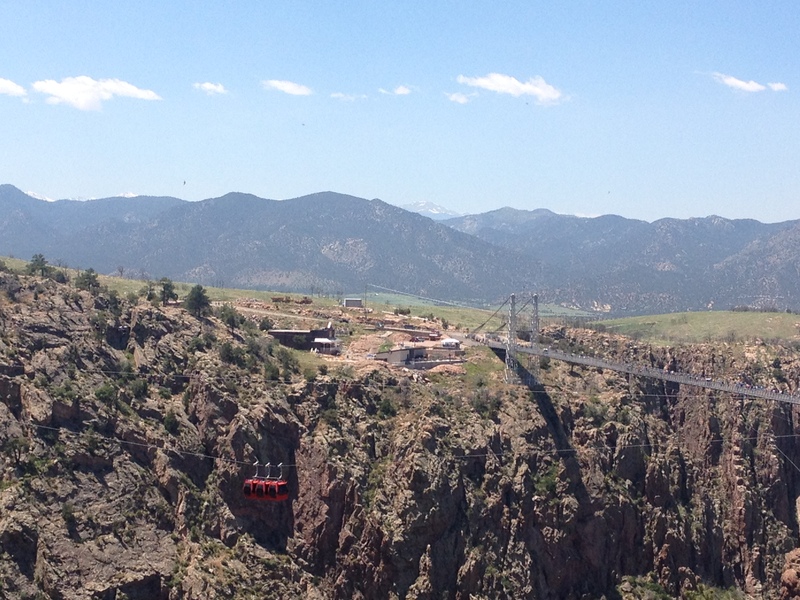 But, since I really wanted to see Royal Gorge, after the rafting trip, we picked up and drove the four miles to Royal Gorge Bridge & Park. 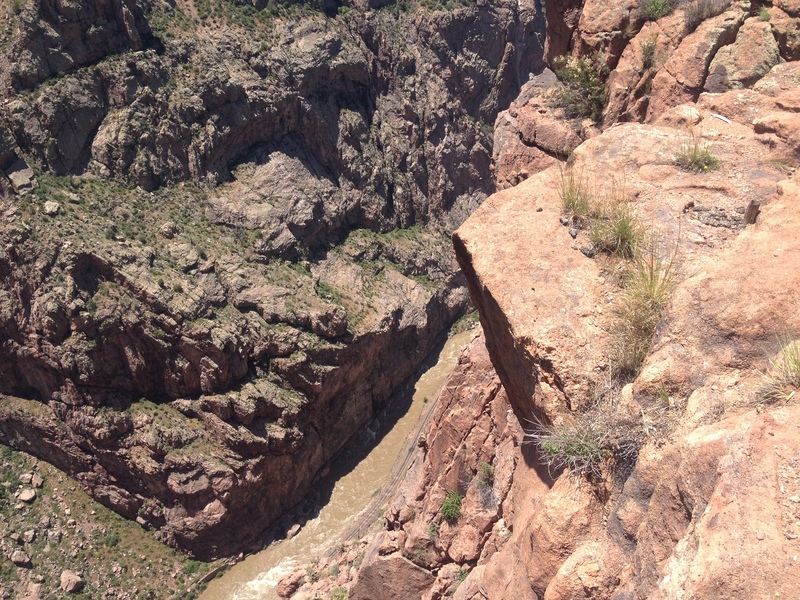 This park offers a variety of crazy ways to get across this gorge, from the red gondola, to zip lining across, to simply walking across the bridge. Unfortunately, walking across the bridge costs $23. Any of the other activities would surely add to that price. None of us really thought it was worth it to pay $23 just to walk across the bridge, but looking around, we saw plenty of people on that bridge. I would probably rather experience this gorge by paying only slightly more money for the scenic railway, or by rafting through it on a calmer weekend. For free, we were still able to get on a short trail in the parking lot, to a nice over look. 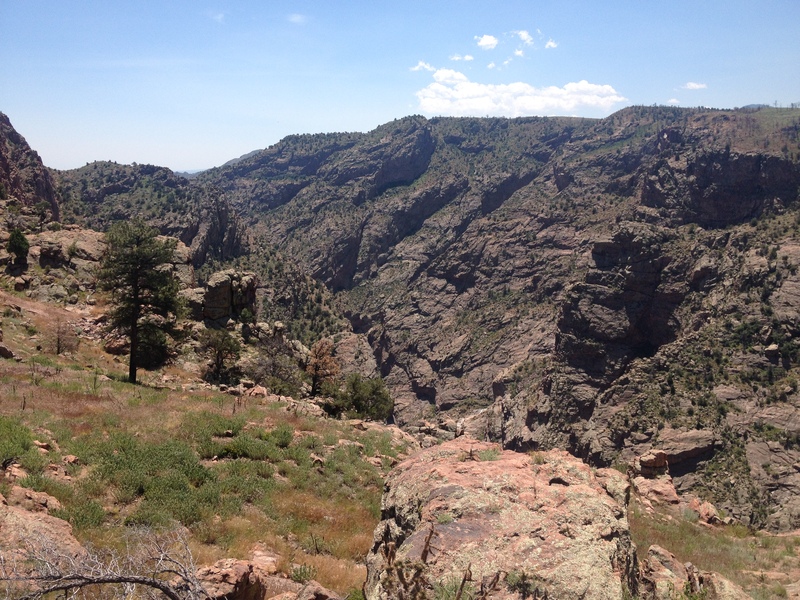 It is really quite an amazing place, almost reminiscent of the large canyons one will find farther west, at places like Glenwood, Moab, and, of course, the Grand Canyon. The craziest thing about the remainder of my Saturday was how little I had been “shaken up” by the entire experience. Rather than being scared, and not wanting to continue (or ever go rafting again), my first instinct was to want to re-do the trip, and get it right this time (i.e. handle the rapids correctly). If there is one thing I can take from this entire experience, it is the importance of being resilient, and taking experiences like this in stride. If anything, I was far more upset about how much it costs to walk over the bridge ($23) than about falling out of the raft. Hopefully this means I am still young and resilient, and not that I am actually crazy. 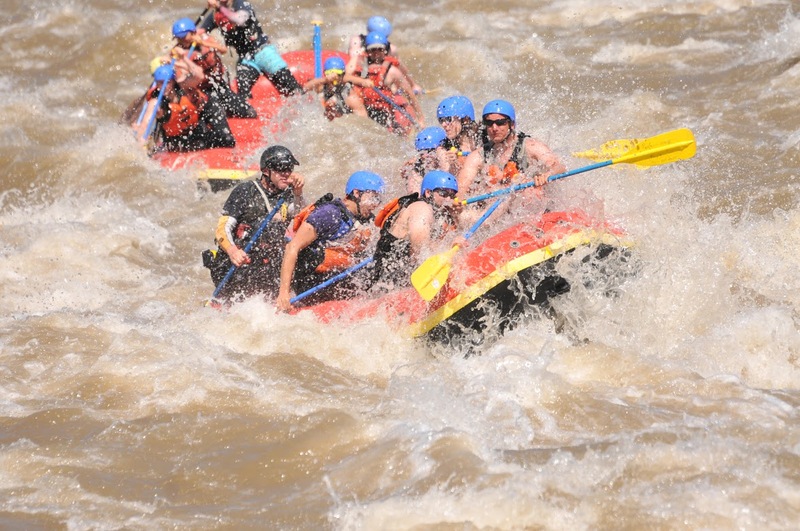 This entry was posted in Colorado, rafting, Water Sports and tagged Arkansas River, celebrations, Colorado, rafting tours, Royal Gorge, Water Sports, whitewater rafting on June 22, 2015 by Stephen Jaye.